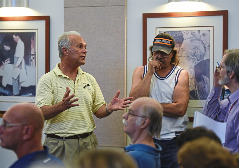 CALIFORNIA, Pa. — The arrival of about 40 Romanian asylum seekers to this small Monongahela Valley community remains the talk of the town a day after more than 150 residents packed a borough council meeting to voice questions and concerns about their presence. The new arrivals, meanwhile, were keeping a low profile Friday, saying in interviews that they came here to seek freedom from persecution in their homeland and are now undergoing the legal process of seeking asylum. Ali George, 24, a native of Bucharest, said they were drawn to California by the same things that might attract anyone — a friendly, inexpensive place to live.